It’s far too warm to be wearing this, but there you have it. I’ll change before the theatre tonight anyway. I thought I’d give you a glimpse of the current Italian silhouette in trousers. Courtesy of Brooks Brothers. Yes, that B-Squared. The cut of the corduroys is called the “Milano” and is their trimmest and most form fitting, lowest rise trouser. Far less comfortable than traditional trousers, their main attraction is … errrr …. attraction. It is hard not to get noticed in trousers that are flamboyantly coloured and cut. The chief difficulty with them, once you manage to pull them on, is finding a suitable sportscoat to wear with them. It must be a bit shorter and certainly cut on the trim side. This is the closest I have in the closet, an Neopolitan made Isaia. And as long as you’re in for the colourful ride, a bit topside works well, too. 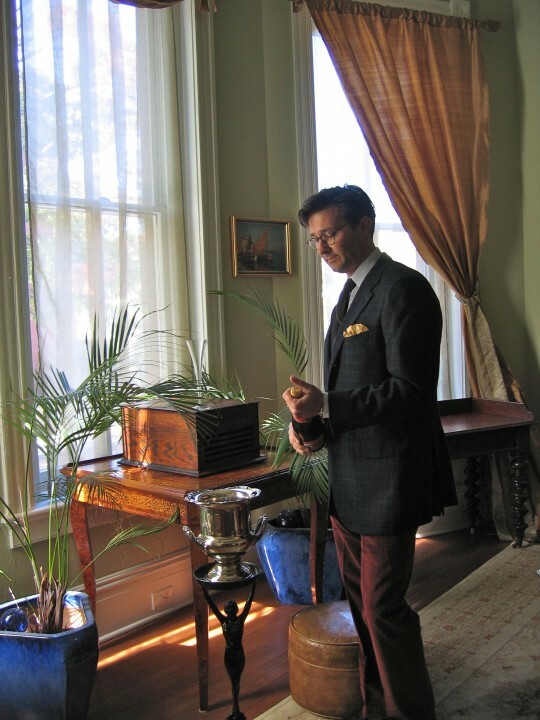 This entry was posted in Elegantology and tagged brooks brothers, Isaia, Milano. Bookmark the permalink. Love that champagne stand! Elegante! TIMELY! I wore my Milano’s yesterday, for what was their third wearing. Once I got home from the office, I marched upstairs, tore them off and threw them on the donate to charity pile we are putting together. They may be the most uncomfortable pants I’ve ever worn that were actually made to my size. Just terrible. Sitting in them is far, far worse then standing. Love the color combination and the fit! Tres Chic! I may have to go with a fuller cut too, but the price for any cut certainly right. The color is great too. Something which would have caught my eye, but I may not have considered until viewing today’s photo. So, thank you. Your photo makes the color appear cranberry, whereas the the Brooks on line catalog states they are red. Where does the color place in the spectrum? Thank you all. And please heed Turling if you are planning a purchase. These are trousers cut for standing and strolling down a boulevard. Go for the next cut up which is straight legged. (Or don’t… you know the look you’re after…) The colour is a red pointing more towards claret maybe. At least a cheap claret. Cranberry isn’t too far of the mark — a bit darker…. Hmm…. dark red kidney bean? Paul, The stand was originally an ash tray. Topped with the bucket it gets used around The Manse. One of my favourite pieces. Very elegant, EEL, very elegant indeed. Nothing like a good glass of Château de Chasselas, eh? LBT, thanks. Coming from you high praise indeed. I do like a good glass of breakfast! half a bottle before porridge? for me it’s a magnum an hour after lunch shared with a lovely friend before partaking on the rest of the day’s adventure. Ooh, so good looking! Still waiting to meet your twin brother! The attire is perfect for our weather in kc right now. Mr. E, I must say I am struck and impressed by the number of social gatherings you manage in the course of one week–do you sleep in the next morning? What vitamins do you and Mrs. E take?? Maybe we aren’t breathing the right high-octane air here in the Midwest/aka God’s Country/aka the Cornhusker State/aka the Beef State/aka Berkshire Hathaway Country as you are there in Virginia?? Add to it the difficult questions of what to wear to multiple events each week . . . what is your secret to maintaining such social energy? P.S. I love the shade of the pants. And I love cords on both men and women. Regarding the matter of comfort . . . men, buck up! Women have been wearing uncomfortable clothes and shoes for their entire adult lives! It’s why we don’t sit or eat when we go out. Armod, great comment! Spontaneous leaps and bounds are to be encouraged at all times. Karena, I’m told that I have a dopplegänger somewhere. Last spotted in NYC late 80’s. Paula, lots of vitamins, moderate daily exercise, hydrate. Most evenings we are in bed by 10 PM. The children assure that we are up no later than 6:15 am. I’m not sure how long we can maintain this pace. I assume that the invitations will slack off sometime. Perhaps during the Summer. (a) It’s a shame you don’t find them comfortable, they look good. The colors in the photo are classic, and yes, elegant. I bought my cranberry cords in a common blue-jean cut and had them tailored a little sharper in the leg – “regular” rise was easy to find. (b) I think you might be about a year or two behind on the modern Italian fashion, since the leg of the trousers doesn’t appear to cling to your calf, the pic suggests that the hem doesn’t land at the top of your ankle bone, and you don’t appear ridiculous wearing them. Nothing against the Italians of course, but certainly a fashion as opposed to style. (c) Does anyone else find it odd that all but the dowdiest of trou seem to come cut with a rise that falls below the actual hip bone (and thus look good only on the VERY slim waisted and flat stomached) whilst OTR dress shirts are apparently made under the assumption that anyone requiring a 34″ sleeve must have a 40+” waist? No harm intended, but Capt. Mike’s comments are precisely why I refuse to post personal photos. Bloody hell mate! Just gotta say I’m in love with your house, but I’ll take a pass on the trousers. Cap’t, I’m with you. Point C is very well put. The slim cut shirts are a little better, but often have that awful no-wrinkle infusion and are cut too narrow across the chest for me.